Trippier was one of the stars of England’s run to a fourth-place finish at the World Cup last summer, with his stunning free-kick against Croatia in the semi-final a particular highlight. And the player himself admits that he hasn’t been at the top of his game in the current campaign. 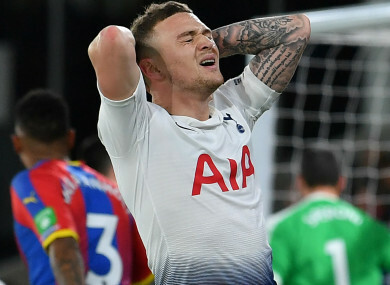 I could have done a lot better this season,” Trippier told The Telegraph. “I’ve picked up a lot of injuries and there’s been games when I’ve looked back and watched, and thought ‘I could have done this better’, ‘I could have done that better’. “It’s all about learning, but I admit I could have done a lot better. I am here now and I need to try to impress to try and start for England and try and do the best I can with every opportunity I get between now and the end of the season. “It’s just one of those things, it just happens. You know when you’ve had a bad game. You can always improve, and we’ve got a good manager back at the club. “Obviously, it’s a long World Cup getting to the semis and stuff,” Trippier said. “The Premier League come around straight away, but it’s what we do it. It’s our job. If we get picked, we all want to play. People can say the World Cup is the reason why, but, for me personally, I don’t think it was. I think it’s just one of those things, you pick up injuries. Email “'I could have done a lot better this season' ”. Feedback on “'I could have done a lot better this season' ”.